The Trek Collective: Starfleet issue dressing gowns, now for girls. 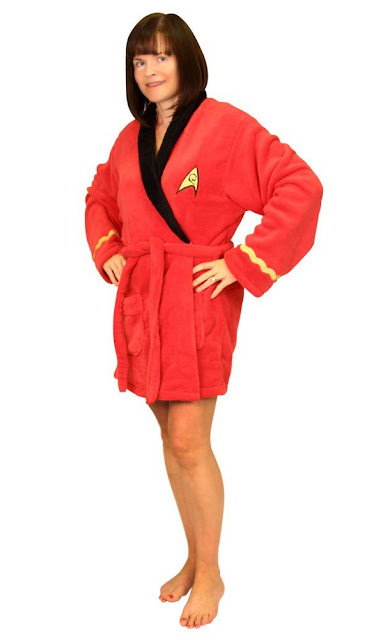 Beam me up, Scotty: You don't have to work aboard the Starship Enterprise to enjoy the comfort of this high quality robe, designed to resemble the classic red uniform of Lt. Nyota Uhura. The robe is made from soft, warm microfleece and has a stitched badge on the front, two pockets, and a wrap around belt. Shorter than our other Star Trek robes, designed for a more flattering look for the ladies. One size fits most. Officially licensed.